About Mammoth – A PLACE FOR PEOPLE WHO LOVE TO LIVE LIFE TO THE FULLEST. Mammoth Lakes is centrally located in the picturesque Sierra Nevada in Eastern California, three hours southwest of Reno, Nevada, and six hours north of Los Angeles. Surrounded by nearly two million acres of one of America’s largest national forests, including the John Muir and Ansel Adams wilderness. 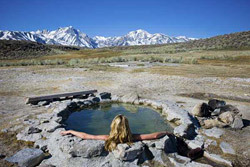 Mammoth Lakes is a place of renewal, reflection and rejuvenation. It is a place of learning, where we empower ourselves and our young. It is a place of adrenaline where Nature can challenge our physical ability and endurance. It is a people place, a proudly local place authentic to the history. It is a place where we can take ownership of an environmentally sensitive and caring value system. It is a romantic place where the excitement, inspiration and even ecstasy can be savored and shared. It is a healthy place where idyllic days are measured by sunrises and sunsets. It is a place with a charm and a generosity of spirit that invites us to return again and again. Most of all, Mammoth Lakes is a place where we can live life to the fullest, a magnet that irresistibly draws us back to ourselves. Mammoth Lakes is indeed a Sierra treasure, and a great home-base location. Whether you are considering Mammoth Lakes as your next investment or purely a vacation, here are some interesting facts you should know.